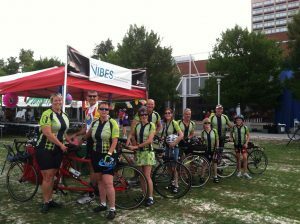 Club VIBES raised money to help find a cure for diabetes and support the overall mission of the Diabetes Association by riding in their annual Bike Event. VIBES helped to sell tickets for the Belk’s Charity Shopping day to benefit a variety of local charities. VIBES partnered with this great cause in which survivors of breast cancer learn fly fishing while gaining back arm strength and receiving support from a small group facing the same challenges. A bike event and silent auction was held October 21, 2012 to benefit both not for profit agencies. With the cyclists help, Club VIBES received over $1300 in donations from the Turning Leaf Tour. Thank you!